GILROY, California — On Sunday, March 3, 2013, forty-eight Jews, Christians and Muslims united to build peace by serving more than 150 kosher and halal meals to the hungry and homeless of Gilroy at St. Joseph's Family Center. 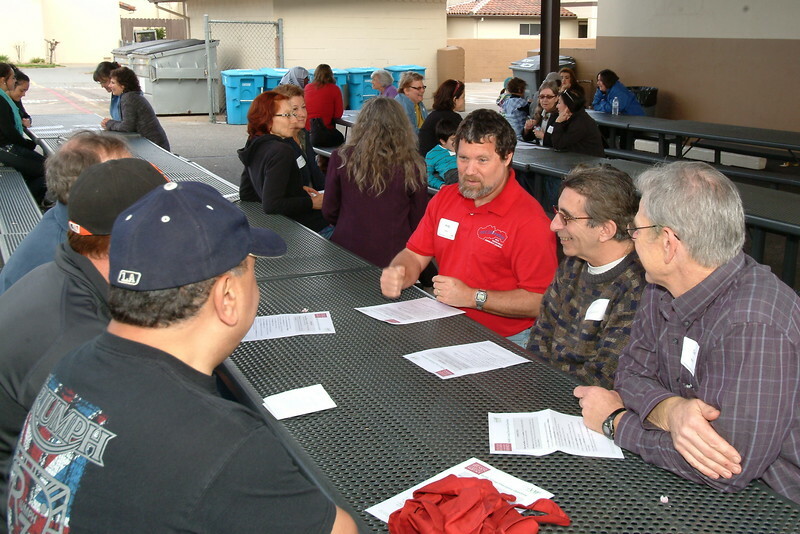 Volunteer orientation was led by Mr. Michael Heil and Susan Meyers of Congregation Emeth, Mr. Aziz Baameur of South Valley Islamic Center, and Pastor Larry Albright of Lincoln Glen Church. Jewish, Christian and Muslim volunteers teamed up in buddy groups to get acquainted, then collaborate to make a halal and kosher meal of lasagna, fruit salad, green salad, and fresh-squeezed lemonade. After meal service, volunteers dined together. Rabbi Debbie Israel of Congregation Emeth offered a closing prayer and blessing with thanks to God for volunteers uniting to feed those in need while building bridges of peace and understanding between our three faith communities. Photos courtesy of Kambiz Naraghi and Ray Hiebert.